You've found the “U.S. Bielefelder Chicken Breeders” page here at Hobby Farm Wisdom! If this is the first time you have visited our site: Welcome! Bielefelder chickens were developed in Germany in the early 1970’s and are still highly respected in their native country. 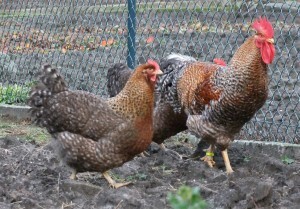 Many breeds were used when developing the Bielefelder, including the cuckoo Malines, Amrock, Wyandotte, and the New Hampshire. The Bielefelder is one of the superior dual-purpose chickens, with a reputation for excellent egg laying abilities as well as large, hearty carcasses. Their eggs are some of the largest produced and are a brown with pink undertones that are unique to their breed. They are an auto-sexing breed, since the male and female chicks look different immediately after hatching it is easy to differentiate them. The combination of these features with a gentle disposition makes the Bielefelder a popular breed.